Adding Marcus to the Mix – 365, 258, originally uploaded by Fluttering By. Yesterday, we traced the kids during Marcus’ naptime. Once he woke up, he was completely enamored with them. Today, we added his to the wall. I was originally thinking that I would have to trace him asleep because no way he would stay still for the process… Boy was I wrong. 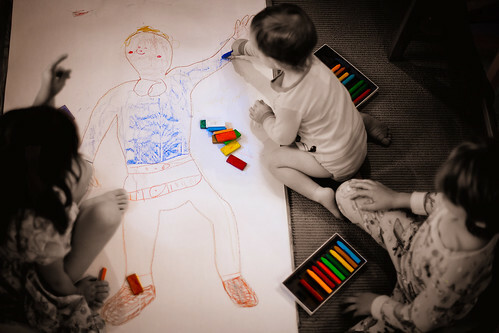 He giggled the whole time I traced him, especially around his tiny little fingers. He even helped color himself. When we were done we hung him up on the wall with the two bigger littles, and he kept running back and forth, pointing to each drawing as we named them. He must have pointed to them at least 30 times.